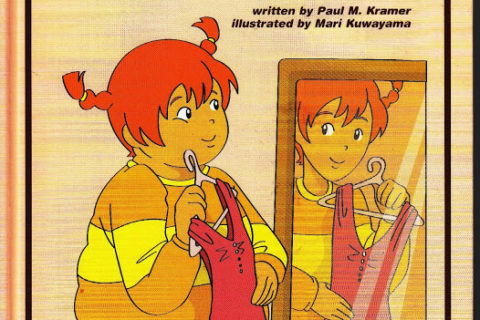 Long time readers will automatically recognize the creepy style of illustrations. (Newbies to our site probably should warm up with the our category of Doris Hall of Infamy.) 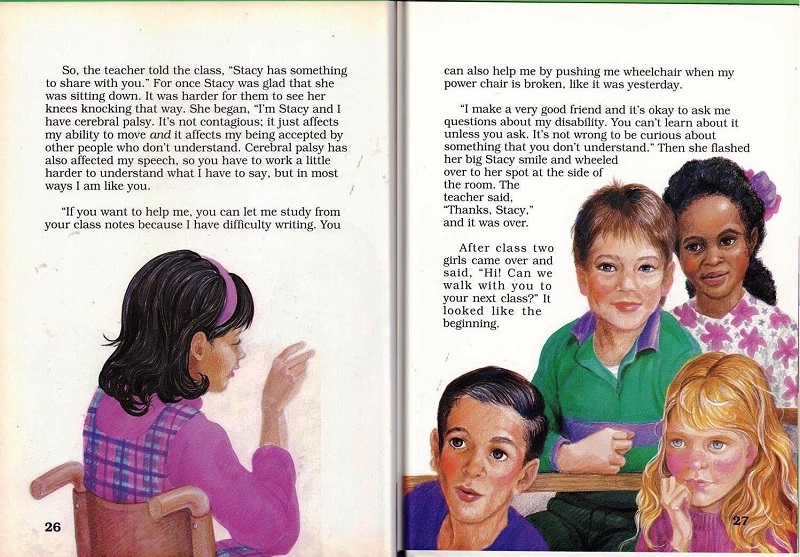 Today’s story features Stacy and her cerebral palsy. She is just like you, but evidently people treat her differently. Naturally, she somehow makes friends with John Stamos (yup, that John Stamos) and he likes her and gave her an autographed picture. I didn’t quite follow how attending a John Stamos concert figured into a cerebral palsy diagnosis, but our gal Doris isn’t really good with her plot lines. However, she did get to go to prom at the end of the story and no, it wasn’t with John Stamos. Previous Post:Fun and Fancy Fashion! Next Post:Too much Chicken Soup? Dear old Doris seems to have had a lot of purple crayons to use up by the time she got round to writing this one. What is with this girl’s hair on the cover?? And why am I surprised? And, do we spell that “Holladay” or “Holiday”–since it seems to be called Holladay Center School, but the people who love her signed it Holiday School. Sometimes it doesn’t pay to be attentive. A man asks her to do a favor and she tells him, “Sure, anything I can do flat on my back!” That sounds so wrong. What exactly is the timeline for this book? We know she was at the center when she was younger and now she is at a new school, but it seems like a longer timeline than most Doris books. Maybe it’s just the limited pages. Also, maybe it’s just me, but it seems a little odd that the only boy she is pictured with at the dance is also in a wheelchair. Doris is trying to make a point about how the boys choose to dance with Stacy not because they feel sorry for her but because they like her for who she is, yet she uses a character that is not likely to feel sorry because he is in a similar situation. I don’t mind the other character, but he does not seem to send the message the text does. 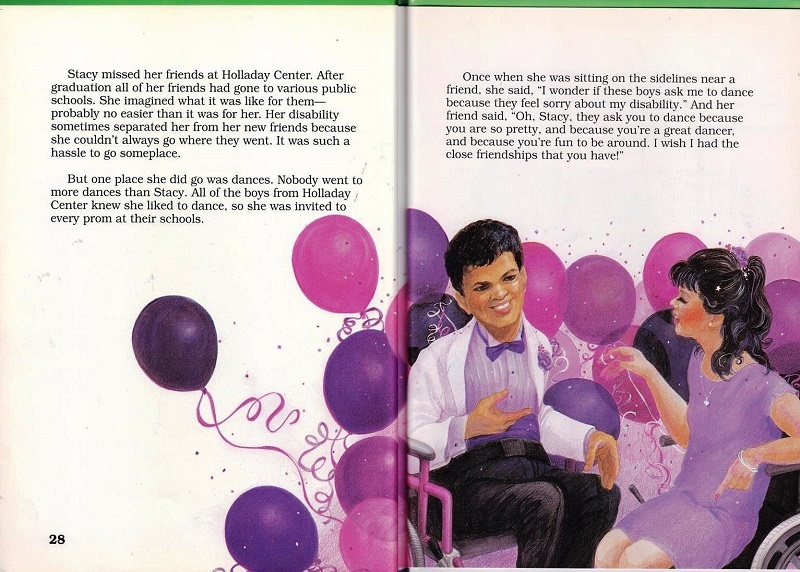 Also, is the dance supposed to be at the Holladay center, at Stacy’s school, or at one of her friend’s school? And why does John Stamos look like a middle-aged woman? Strangely, Doris apparently did not illustrate this herself. Yet it still looks like a Doris book. Doris doesn’t illustrate her own books, She works in collaboration with Grace Evans and her mighty crayons. My mistake. I can’t believe I never looked closely enough at the bylines before! 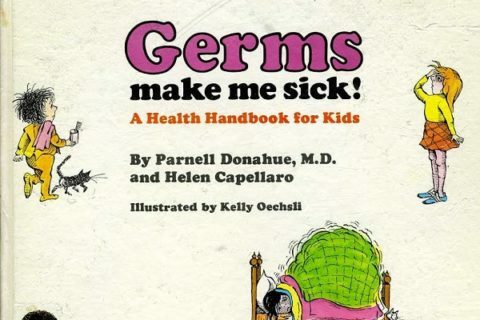 I was somehow under the impression that Doris was author/illustrator. Now I think our Doris Hall of Fame (or Infamy) should be the Doris/Graci Hall, because text and illustrations together produce that special je ne sais quoi. 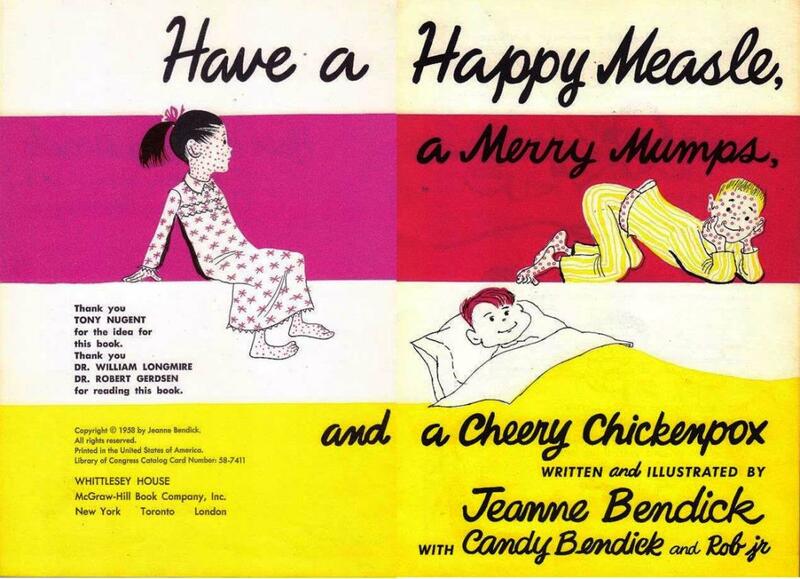 It’s the same illustrator as her other books. I thought Grace Evans was her usual illustrator. 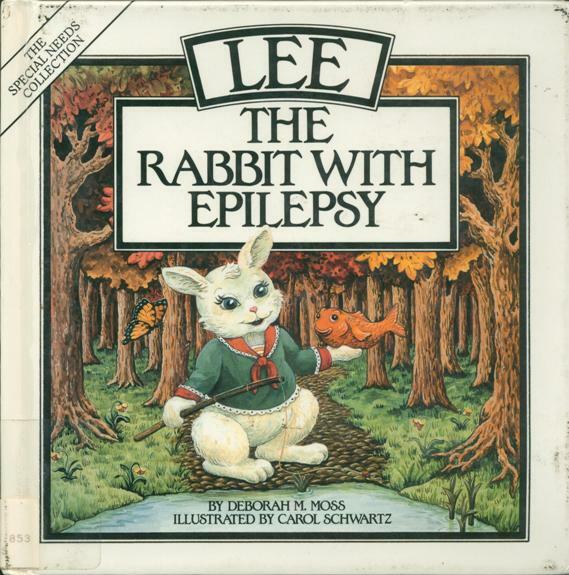 Graci Evans is her usual illustrator, and as far as I can tell she uses pretty much the same style in nearly all of the books she illustrates (except for the drawings in Doris Sanford’s Once I Was… series, where she used a much more cartoonish style). 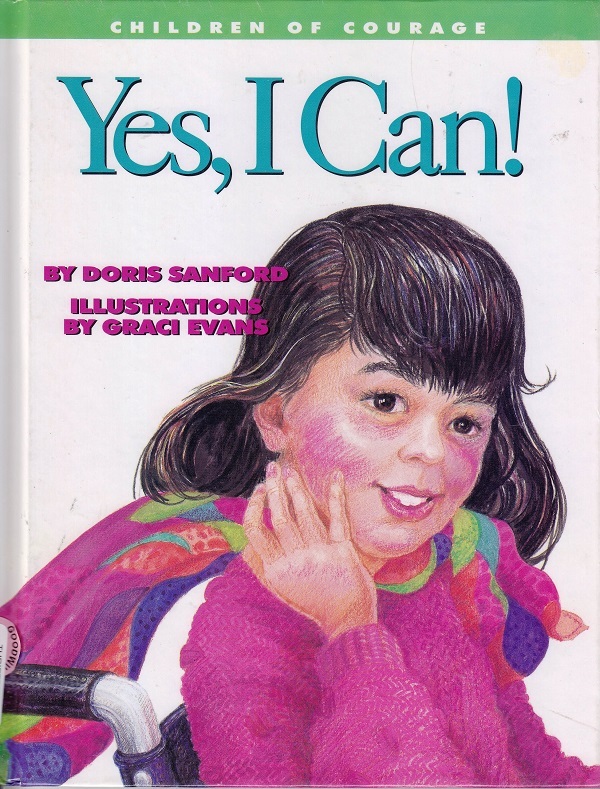 That’s why it’s often easy to identify a Doris Sanford book just from looking at the cover alone. I don’t think she ever worked with another author. Hey, she goes to prom with Taylor Lautner! All the celebrities come to her yard. Wow, I don’t read here for a couple of weeks and somehow I miss a new Doris post! Those are some of my favorites for some odd reason. 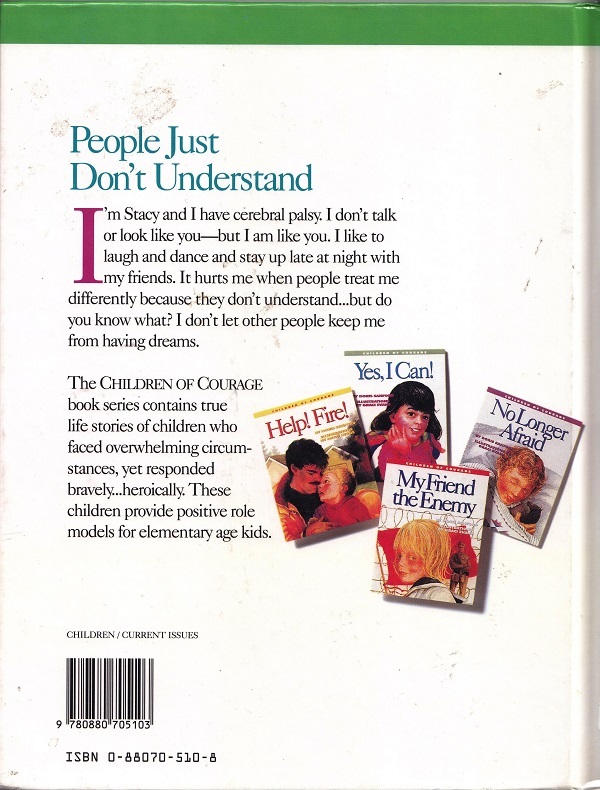 I notice that this was the only book in the Children of Courage series that hadn’t been covered yet, so now those are all done. And yet looking at Amazon, there are so many titles by Sanford that seem so crazy at first glance that haven’t even been touched on here! The Comforter, Love Letters, and especially Within a Yard Of Hell, which appears to be a novel for adults. 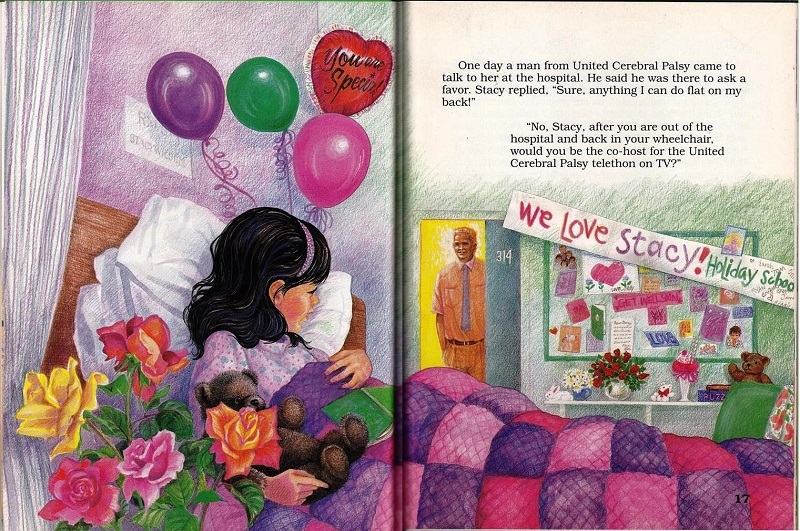 I’m glad I’m not the only one that thought that the John Stamos in the book looked like a chick. I couldn’t tell who that was at first. More Doris! Excellent. I thought that well was dry. Just wait till you see the future, if you think the past was weird. The USA could have Donald Trump as President! Oh, please, where is Dwight D. Eisenhower when you need him!